Photographs, text and formatting by Jacqueline Banerjee. Notwithstanding the deaths of Morris and Burne-Jones in the 1890s, the firm of Morris & Company continued in business — with its shop in central London and studio-workshops at Merton Abbey, Surrey — until its voluntary dissolution in 1940. Although it was reorganised in 1905 and registered as "Morris & Company, Decorators Ltd.," a large measure of continuity was maintained through Dearle's role as chief designer. Having joined the firm as a teenager, and having worked with Morris in almost all branches of its production, Dearle identified closely with its stylistic ethos and tradition of workmanship. 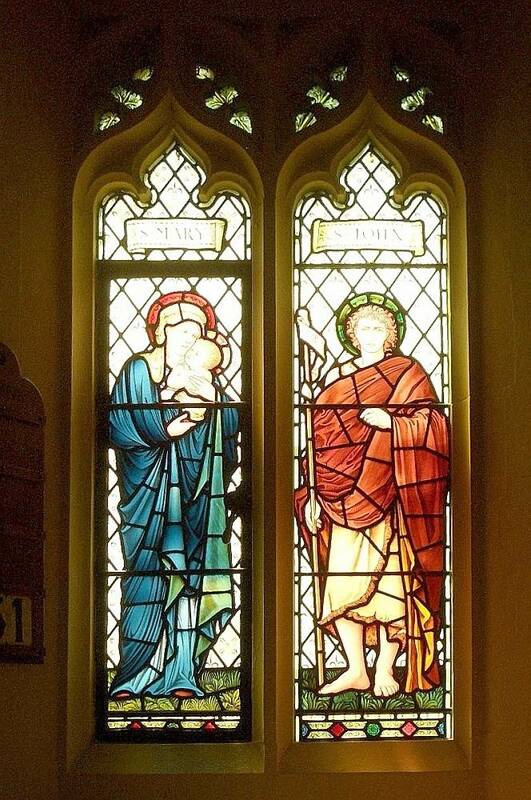 In stained glass he revered the later collaborative work of Morris and Burne-Jones, and it is clear that under his supervision the Merton Abbey workshop rarely deviated in any significant way from the style and technique of the windows made during their lifetimes. In this case, Dearle himself contributed the figure of Mary (Green 9). Despite what Cormack says, the different styles are noticeable. The homely-looking mother cuddling her plump baby, with her cheek pressed against his, lacks the poignant look of the typical Burne-Jones figure. 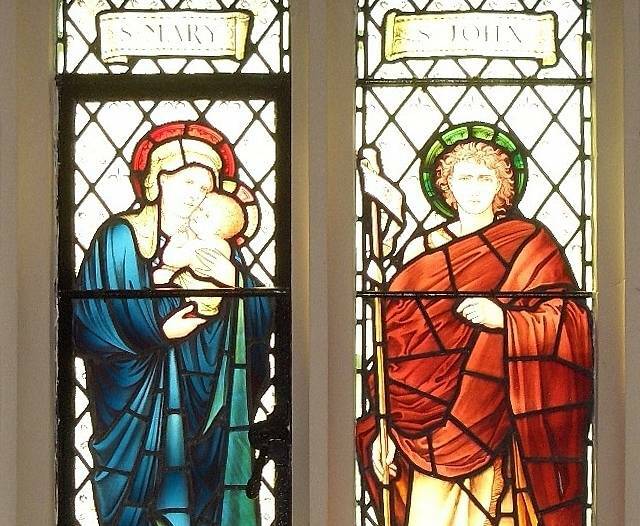 Compare Mary here to Burne-Jones' Mary in The Nativity window in Ponsonby Church, Cumbria, for example, or, more appropriately, to Mary holding the infant Jesus in Cormack's Figure 20, following p.22 in his catalogue (see below). In both these, Mary's expression seems sadder than it does in Dearle's representation, and her eyes are downcast. Cormack, Peter. An Exhibition of Morris & Co.'s Stained Glass for the Chapel of Cheadle Royal Hospital. London: Haslam & Whiteway, 2008. (Exhibition Catalogue.) Web. 2 January 2013. Eberhart, Robert. "Stained glass windows at St. Mary's." Church Stained Glass Windows. Web. 2 January 2013. Green, Lionel. St Mary the Virgin Merton Park: A Guide and History. Available at the church. Print.